HOT DOG DAYZ!!! 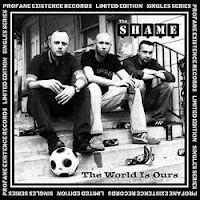 : Record Review: The Shame - The World Is Ours 7"
Record Review: The Shame - The World Is Ours 7"
The cover photo shows the Tulsa, OK three-piece sitting on a stoop, surrounded by empty Strongbow and Guinness cans, while the requisite soccer ball rests a step below them. Look close enough and you’ll see that Malone is even wearing a Fred Perry. Flipping it over will reveal a shield logo comprised of pint glasses, a soccer ball, and someone waiving an “Oi!” flag. About all it's missing is a boot print. Without any prior knowledge of the band, it’s difficult to decipher whether it’s a sincere homage to classic Oi! imagery, or a tongue-in-cheek pisstake. ...read entire review here.